Pictured: From left, Amanda G. McKendree, Janie M. Harden Fritz, Ronald C. Arnett, Scott R. Stroud. Certificate of Appreciation for leadership and service 2015-2018: Amanda G. McKendree. 2017 Communication Ethics Teaching Award: Janie M. Harden Fritz. Top Single-Author Book of the Year Award: Ronald C. Arnett, Levinas’s Rhetorical Demand: The Unending Obligation of Communication Ethics (Carbondale: Southern Illinois University Press, 2017). 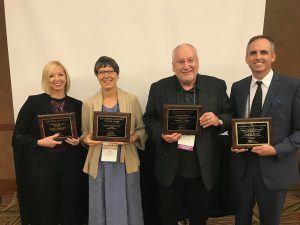 Top Journal Article of the Year Award: Scott R. Stroud, “Rhetoric, Ethics & the Principle of Charity,” Language and Dialogue 7.1(2017), 26-44.